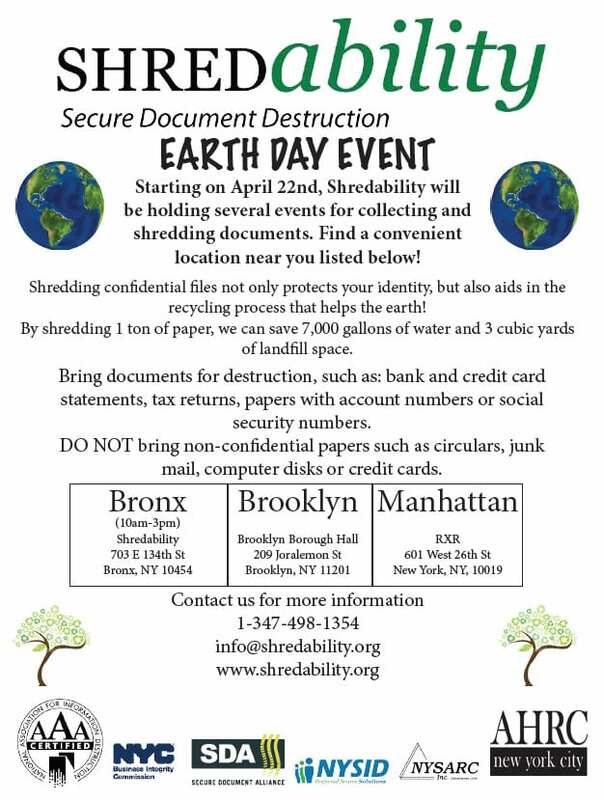 On Friday, April 22nd, SHREDability will be celebrating Earth Day with events in Brooklyn, Manhattan and the Bronx, collecting and shredding confidential documents for members of these communities! Download our flyer for drop-off locations and details! Additionally, Earth Day events will continue from Monday, April 25th to Friday, April 29th, from 8:00 am to 7:00 pm. Stop by Brooklyn Borough Hall during Earth Week to drop off items in SHREDFEST bins, sponsored by AHRC New York City and SHREDability, a secure document destruction company. To learn more, download the flyer.